Whatever you choose to call it – the ‘Stone Age diet’ , ‘Hunter-gatherer diet’, ‘Paleolithic diet’ or just the ‘Paleo diet’ – one thing is for sure. It’s growing in popularity by the day and going mainstream. Even supermarkets are catching on (and cashing in), stocking stuff your local supermarket might not have had a few years ago. But is the diet of Wilma and Fred nothing but a craze that will soon fade away? And more importantly, can it actually deliver in terms of health benefits? We’ve looked at the science of it all and here’s what we found. In one small study 1, participants were asked to adhere to a Paleo diet for 3 weeks. During the study period, their weight dropped by about 2.3kg (about 5lb), their waist circumference shrunk by 1.5cm (about 1/2in) and their blood pressure also improved. Wondering how the volunteers were able to experience results so fast? Well, the researchers report that the Paleo diet helped the subjects reduce their overall daily calorie intake by about 900kcal and their daily fat intake by 20g. But more impressively, the participants daily carbohydrate intake dropped by 177g on average! Adhering to the Paleo diet can lead to a 72% reduction in plasminogen activator inhibitor-1 (PAI-1) 1. High levels of PAI-1 have been linked to the development of type 2 diabetes 2 as well as an increased risk of heart attacks in both men and women 3. Moreover, other studies have shown that even a short-term adherence to the Paleo diet results in improved blood pressure, blood lipid and blood glucose control in addition to improved insulin sensitivity while reducing insulin secretion 4. What if you’ve already been diagnosed these conditions? Research indicates that the Paleolithic diet lowered blood pressure, fasting blood glucose, HbA1c and triglyceride levels in patients with type 2 diabetes 5. The study participants also lost weight and had higher HDL levels than individuals on a standard diabetic diet. The Standard American Diet is often said to be inflammation promoting because it is packed with pro-inflammatory foods, such as refined grains, high fructose corn syrup, sugar and industrial oils (like those of canola, safflower and sunflower). To make matters worse, it’s also low in inflammation fighting foods such as veggies, omega-3s and fruits. The Paleo diet is the exact opposite: it’s packed with foods that help reduce inflammation, while foods that can trigger inflammation are off-limits. Indeed, studies have shown that the Paleo diet leads to a reduction of markers of inflammation such as C-reactive protein and PAI-1 1, 2. The Standard American Diet relies heavily on industrial vegetable oils, highly processed foods and sugar-laden ones – foods thought to be an optimal environment for ‘bad bacteria’ to thrive, upsetting the health balance of bacteria in your gut. Bad bacteria produce endotoxins hat can damage to the gut’s lining 12, and are increasingly linked to a wide range of health problems from obesity to allergies. The Paleo framework promotes the consumption of gut-healing antioxidants and fermentable fibers from fruits, veggies and spices and restricts the intake gut unfriendly foods. Thus it helps to thwart inflammation and restore the beneficial bacteria in your gut that help process hard-to-digest foods, produce nutrients, and even guard against disease. Research has shown that bacterial overgrowth in the small intestine may compromise the absorption of nutrients essential for skin and hair health 13. So if you’re nutrient deficient or have a weak immune system (due to a very poor diet, for instance), it will show on your skin, hair and nails. Let’s face it: your hair and nails are not essential to your survival. An unhealthy balance of gut flora will also promote inflammation, increasing the likelihood of skin disorders such as acne14. In switching to a Paleo diet, you’ll be eliminating the dietary offenders messing with your gut while ingesting more nutrients that will help rejuvenate and nourish your hair, skin and nails. Speed up muscle recovery after a workout. Allow for longer training sessions. If you’re trying to get pregnant, make sure to check your diet. Research suggests that diet (in addition to level of physical activity and overall lifestyle habits) can improve your odds of conceiving a child 17. To boost your chances of conceiving, try the Paleo diet at least 3 months before – your sperm or eggs will be healthier after you’ve followed a diet packed with vitamins, minerals, antioxidants and healthy fats. You’ll also be avoiding unhealthy trans fats which have been shown to increase infertility due to ovulation issues 17 and low sperm count 18. As the Paleo diet is a relatively recent phenomenon, most of the studies and research so far have involved small numbers of people and often did not include long-term follow-up or a control group. However, the core principle of the Paleo diet is that one should eat fresh, unprocessed foods and eschew processed foods. You’ll be hard-pressed to find an expert who’ll argue with that. So while the diet as a whole hasn’t been thoroughly studied, the payoff for cutting processed foods from your diet could be huge. And get this. One study found that people who cook at least 5x a week are 50% more likely to be alive 10 years later compared to those who rely more on processed foods.19 Also, the Paleo diet is very easy to follow once you get the hang of it and involves no calorie counting. What some health professionals are likely to worry about is eating too much red meat on this diet, which is easily avoided by including more white meat (e.g. poultry). The Paleo diet also excludes dairy, legumes and grains. However, the goal of the Paleo diet isn’t to re-enact the lifestyle and diet of our forefathers food for food, but to get the general gist – the principle of the diet. As such, most people customize the Paleo diet to suit their needs. 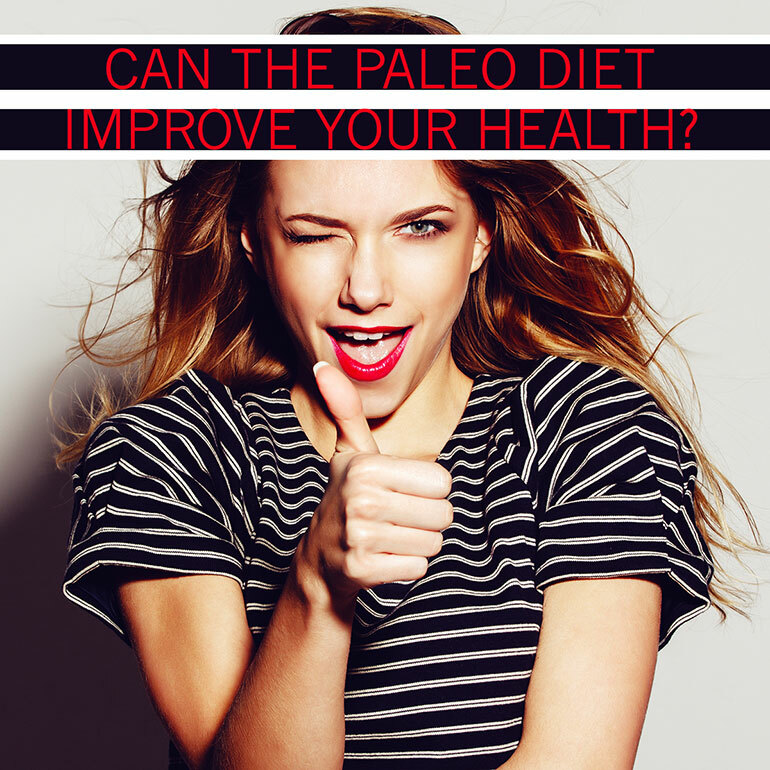 How long do you have to follow the Paleo diet before you see results? Most people will feel better and much more energetic after about 30 days. For more tangible results, why not check your fasting blood glucose levels, C-reactive protein markers and lipid profile prior to going Paleo and a month later? And remember, for optimal results make sure to get enough sleep, exercise and tank up with some daily sunshine. Österdahl, M., Kocturk, T., Koochek, A., & Wändell, P. E. (2008). Effects of a short-term intervention with a paleolithic diet in healthy volunteers. European journal of clinical nutrition, 62(5), 682-685. Festa, A., D’Agostino, R., Tracy, R. P., & Haffner, S. M. (2002). Elevated levels of acute-phase proteins and plasminogen activator inhibitor-1 predict the development of type 2 diabetes the insulin resistance atherosclerosis study. Diabetes, 51(4), 1131-1137. Thögersen, A. M., Jansson, J. H., Boman, K., Nilsson, T. K., Weinehall, L., Huhtasaari, F., & Hallmans, G. (1998). High plasminogen activator inhibitor and tissue plasminogen activator levels in plasma precede a first acute myocardial infarction in both men and women Evidence for the fibrinolytic system as an independent primary risk factor. Circulation, 98(21), 2241-2247. Frassetto, L. A., Schloetter, M., Mietus-Synder, M., Morris, R. C., & Sebastian, A. (2009). Metabolic and physiologic improvements from consuming a paleolithic, hunter-gatherer type diet. European journal of clinical nutrition, 63(8), 947-955. Jönsson, T., Granfeldt, Y., Ahrén, B., Branell, U. C., Pålsson, G., Hansson, A., … & Lindeberg, S. (2009). Beneficial effects of a Paleolithic diet on cardiovascular risk factors in type 2 diabetes: a randomized cross-over pilot study. Cardiovasc Diabetol, 8(35), 1-14. Huang, J. H., Lu, Y. F., Cheng, F. C., Lee, J. N., & Tsai, L. C. (2012). Correlation of magnesium intake with metabolic parameters, depression and physical activity in elderly type 2 diabetes patients: a cross-sectional study. Nutr J, 11(1), 41. Fukudome, S. I., & Yoshikawa, M. (1992). Opioid peptides derived from wheat gluten: their isolation and characterization. FEBS letters, 296(1), 107-111. Herbert MR, Buckley JA. (2013) Autism and dietary therapy: case report and review of the literature. J Child Neurol.;28(8):975-82. Nadon G, Feldman DE, Dunn W, Gisel E. (2011) Association of sensory processing and eating problems in children with autism spectrum disorders. Autism Res Treat:541926. Bjarnason I, MacPherson A, Hollander D (1995) Intestinal permeability: an overview. Gastroenterology, 108:1566–1581. Clarkson P. & Thompson HS (2000) Antioxidants: what role do they play in physical activity and health? Am J Clin Nutr 72(suppl):637S–46S. Chavarro, J. E., Rich-Edwards, J. W., Rosner, B. A., & Willett, W. C. (2007). Dietary fatty acid intakes and the risk of ovulatory infertility. The American journal of clinical nutrition, 85(1), 231-237. Chavarro, J. E., Furtado, J., Toth, T. L., Ford, J., Keller, M., Campos, H., & Hauser, R. (2011). Trans–fatty acid levels in sperm are associated with sperm concentration among men from an infertility clinic. Fertility and sterility, 95(5), 1794-1797. Chen RC1, Lee MS, Chang YH, Wahlqvist ML. Cooking frequency may enhance survival in Taiwanese elderly. Public Health Nutr. 2012 ;15(7):1142-9.